Having just returned from the SharePoint Summit in Canada where I experienced real snow, I thought I’d share a few thoughts for the ladies out there planning on seeing snow for the first time. 1. Good hair days – gone. Snow, wind, hoodies, scarves and hats are not hair friendly. Just learn to live with the bad hair days or you’ll ruin your holiday worrying about it. 2. Make-up – hardly worth bothering. Apart from waterproof mascara and eyeliner, it will all rub off in an hour. Put make-up on before you get dressed or you’ll sweat it off before you leave the room. 3. Wrinkles – scary! The air at altitude is so thin and dry that every little line is exaggerated. Take a very good moisturizer, three times as strong as you normally use. And preferably a good quality eye cream. The elements are hell on the face which is exposed a lot. 4. Sunglasses – don’t forget these. Even when it’s snowing the glare can be unbearable. 5. Lips – standard lip ice doesn’t cut it. I had Labello lip ice, Elemis lip balm and Victoria Secret lip gloss. The gloss worked the best by far! Your lips take a beating in the wind and you end up licking them a lot. The get dry so quick. 6. Ears. Change the whole outdoor experience by having ear warmers. And not those cute ones with animals on an alice band type thing. They might look cute, but they will irritate you almost immediately when you have to put your hat or hoodie on. Get the ones that go around the back of your neck and flat on your ears. This is the best investment you’ll make. 7. Hands – take good gloves. If you’re planning on building snowmen, (and not all snow is snowman snow unfortunately), take leather gloves so they don’t soak through. Wear two sets of gloves if necessary. Thinner leather ones fit fine under the material ones. 8. Upper body – get a good quality thermal, don’t skimp on this. You’ll be glad by day 2 outside. 9. Torso – get a jacket that covers the bum and blocks the wind. Get one that has lots of pockets then you don’t need to carry a handbag around which also gets irritating as it keeps falling off your shoulder from the baggy jackets and scarves. 10. Feet – boots are a must! Tackies are no use in the snow. They get wet and soggy real quick and there’s nothing worse than wet, cold feet. Also get good quality thermal long socks, make sure they fit cos there’s different sizes. 11. Layers layers layers – you’ll hear this a dozen times. While it works, what they don’t tell you is that it takes 20 minutes just to put your clothes on and get them off again. No such thing as rushing around. 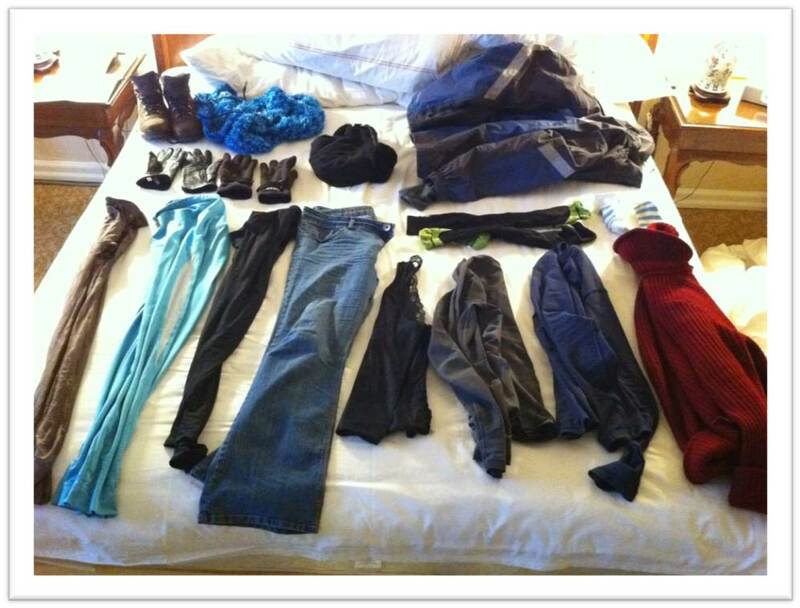 And breathing … yeah, not so easy when you have 4 pairs of pants on, 4 tops and a jacket. Snow ain’t for sissies … but it is awesome! Just be prepared. I can highly recommend Canada. You just have to see the Rockies before you die. Now those are mountains! 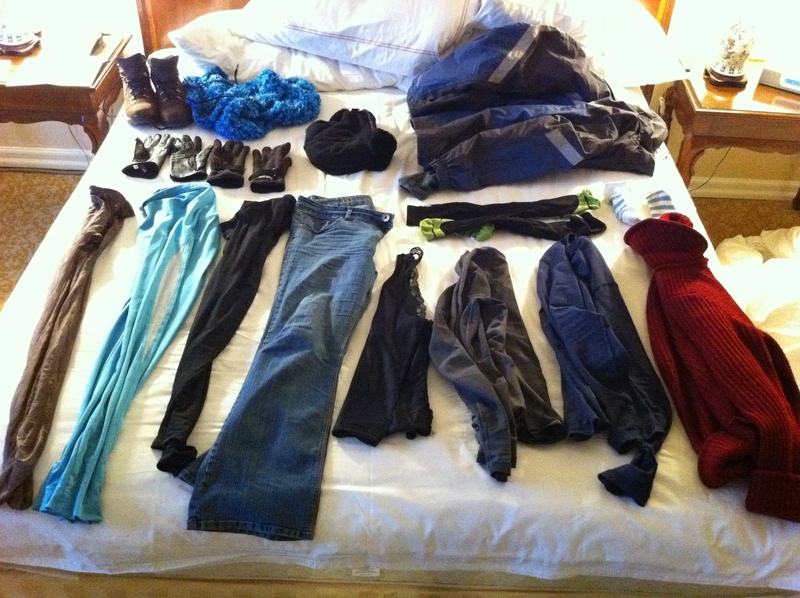 This is everything I had to put on everyday to survive Canada. 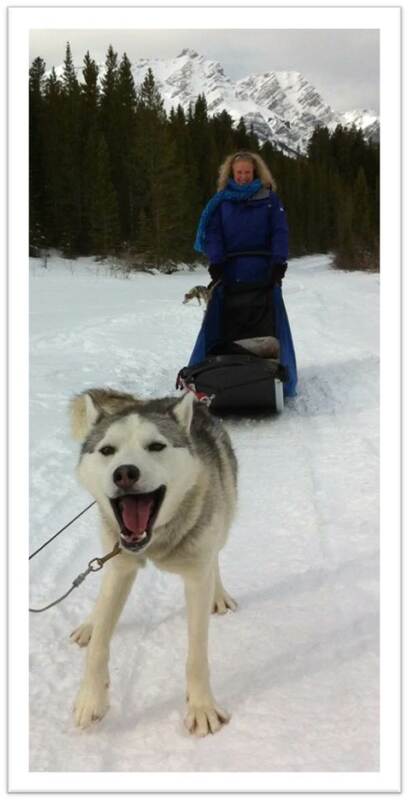 And for something completely different, go dogsledding! It rocks! This is me with Dreamer, the coolest dog on earth. @Dave, hehe. Yeah, there are two CA’s now. 🙂 Thank you so much for the compliment. Ha! Most of this is true for boys too. My tip – heavy wool socks are the best.